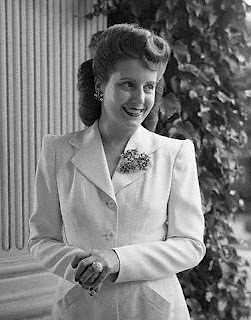 María Eva Duarte de Perón (7 May 1919 – 26 July 1952) was an Argentine political leader, the second wife of President Juan Perón (1895–1974) and served as the First Lady of Argentina from 1946 until her death in 1952. She is usually referred to as Eva Perón, or by the affectionate Spanish language diminutive Evita. She was born in the village of Los Toldos in rural Argentina in 1919, the youngest of five children. In 1934, at the age of 15, she went to the nation's capital of Buenos Aires, where she pursued a career as a stage, radio, and film actress. Eva met Colonel Juan Perón on 22 January 1944, in Buenos Aires during a charity event at the Luna Park Stadium to benefit the victims of an earthquake in San Juan, Argentina. The two were married the following year. In 1946, Juan Perón was elected President of Argentina. Over the course of the next six years, Eva Perón became powerful within the pro-Peronist trade unions, primarily for speaking on behalf of labor rights. She also ran the Ministries of Labor and Health, founded and ran the charitable Eva Perón Foundation, championed women's suffrage in Argentina, and founded and ran the nation's first large-scale female political party, the Female Peronist Party. In 1951, Eva Perón announced her candidacy for the Peronist nomination for the office of Vice President of Argentina, receiving great support from the Peronist political base, low-income and working class Argentines who were referred to as descamisados or "shirtless ones". However, opposition from the nation's military and bourgeoisie, coupled with her declining health, ultimately forced her to withdraw her candidacy. In 1952, shortly before her death from cancer at the age of 33, Eva Perón was given the title of "Spiritual Leader of the Nation" by the Argentine Congress. Supporting her husband's regime enthusiastically even as she was dying, Eva Perón was given a state funeral upon her death, a prerogative generally reserved for heads of state.